When two-time World Middleweight champion Daniel Geale entered the ring to make the fourth defense of his IBF world title in a rematch against former two-division world champion Anthony Mundine on January 30th he was looking to avenge the lone defeat of his career. In their first bout in 2009, Geale then holder of the IBO Middleweight title lost a close split decision to Mundine. In the years following the first bout Geale rebounded to win the IBF Middleweight title in 2011 by beating Sebastian Sylvester and successfully making two defenses of the title. Geale then briefly unified the IBF and WBA titles in September of last year by defeating longtime WBA champion Felix Sturm before being stripped of the WBA title for opting to fight Anthony Mundine rather than the WBA mandatory challenger/Interim champion Gennady Golovkin. It was clear from the opening bell that Geale was the sharper fighter often beating Mundine to the punch and landing in combinations. This was complimented by solid defense from Geale and along with steady pressure was able to disrupt Mundine from having a consistent offensive flow throughout the fight. Geale’s convincing unanimous decision victory over Mundine only validates that he is a force to be reckoned with among the cream of the crop of the Middleweight division. 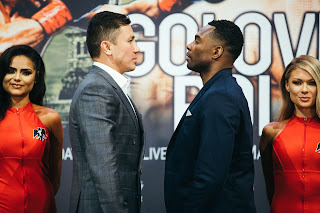 Before Geale can set his sights on unification of the Middleweight division against the fellow champions Sergio Martinez, Gennady Golovkin, and Peter Quillin he must first make a mandatory defense of his IBF championship. Two short days after Geale successfully defended his title against Anthony Mundine, an IBF elimination bout was held in Düsseldorf, Germany between Felix Sturm and longtime Middleweight contender and former world title challenger Sam Soliman. Soliman who has been a top Middleweight contender for several years has long been considered one of the top fighters in Australia. He has faced a who’s who of top contenders and former world champions including Winky Wright, Howard Eastman, Sakio Bika, and Anthony Mundine just to name a few. Despite having a fine career of fifty-three professional fights and riding a seven fight winning streak leading up to his clash with the former champion Sturm, Soliman at thirty-nine years of age one might argue could have been getting perhaps his last opportunity to position himself to fight for a world title. A point some might argue is that despite having a solid career, compiling a record of 42-11, 14 Knockouts that he has had mixed results when he has been put against world class opposition including three losses to Anthony Mundine fought at the 168lb. Super-Middleweight limit. It was on this basis that many thought Soliman was an underdog leading up to his fight with Sturm. What also did not seem to play in Soliman’s favor was the fact that this fight would be fought on Sturm’s home turf in Germany where previous opponents have found it difficult to earn decisions in fights that some observers feel should have gone their way. Most notably in the opinion of this observer Sturm’s controversial draw in a title defense in December 2011 against British contender Martin Murray in a fight where many observers this one included felt that Murray was the busier fighter down the stretch and deserved the decision. One thing of interest as this fight approached was the question of how Sturm would perform coming off his loss to Daniel Geale. One thing that Geale was able to accomplish against Sturm that I felt would potentially be an asset for Soliman was how he was able to outwork Sturm with a high work rate and consistently had Sturm on defense. For a fighter who has a high work rate as Soliman has; I felt that it would be a vital to his success in this fight to start fast and get his punches off first before Sturm could land. One thing Soliman would have difficulty with was Sturm’s ability to counterpunch. I wondered how Soliman’s defense would fair against Sturm who fights in spurts but tends to land crisp, accurate combinations when he lets his hands go. When the fight got underway I was somewhat surprised with how easily the former world champion Sturm was able to land his right hand on Soliman who seemed to have trouble getting into a rhythm early on in the fight. In the second round Sturm floored Soliman with a massive right hand and it seemed that Soliman was in serious trouble. Soliman arose from the knockdown and despite being staggered periodically throughout the early rounds managed to find his stride in the second half of the fight. Although I scored the first four rounds for Sturm including a two point round for the knockdown in round two, I was impressed with Soliman’s ability to recover and how he was able to gradually work his way back into the fight. In the second half of the contest I felt Soliman just did a little more than Sturm even though there were periods that Sturm seemed to land the cleaner punches. This was a case of what I often say is what a judge prefers clean accurate punching and defense, or high volume of punching and combinations. For most of the second half of the fight it seemed as though there were times that Soliman was able to keep Sturm on the defensive and was able to land three punches to Sturm’s one punch. At the end of the twelve round bout it seemed logical that the fight would be close. No matter which way the fight went I felt that Sam Soliman deserved a lot of credit for the determined effort he put forth later in the fight. Despite the gutsy effort of Soliman there was a part of me that felt that it wouldn’t be enough. After all, this fight was fought on Sturm’s home ground and it would be hard to argue that he didn’t have a decent lead on most scorecards midway through the fight and that Soliman had a hole to climb out of. It has become the norm to see a closely fought battle in most of Felix Sturm’s fights. This bout was no different… While waiting for the official scores to be announced I almost out of instinct began having thoughts of the controversial decisions in Sturm’s recent battles against Martin Murray and Matthew Macklin. In bouts that could have gone either way. I wondered if this fight would add to the opinion of some that it is very difficult if not next to impossible to get a decision victory over Sturm in Germany. Of course the rare exceptions to that theory were Sturm’s first fight with two-division world champion Javier Castillejo whom stopped Sturm in the tenth round in what is to date the lone knockout loss of Sturm’s career and Sturm’s loss to Daniel Geale last year. Nevertheless I felt that no matter the outcome of this fight that it would be the subject of much debate in the weeks and months that follow. When the official decision was announced, I was initially confused as to the result due to a mishap by legendary ring announcer Michael Buffer who initially began announcing Sturm as the winner only to quickly correct himself and announce twice that Soliman had won by a narrow unanimous decision winning the fight by one point on two official scorecards. What did not strike me as overly out of the ordinary was the scorecard of Judge Benoit Roussell who scored the fight 116-111 for Soliman. Unofficially I had the fight scored the same as Judges Mickey Vann and Steve Weisfeld who scored it 114-113 for Soliman. In all truth and honesty I would have no complaints had this fight been scored a draw. The fight ended up being very close and competitive in the second half of the contest and even though I felt Soliman was just the more active of the two and outworked Sturm in the later rounds, I can certainly see how some might feel that the fight could have gone in favor of Sturm. As for why the scorecard of Judge Benoit Roussell did not strike me as out of the ordinary? It is not uncommon in the sport of Boxing particularly in high profile fights to see a scorecard that may differ from the other judges involved in the scoring or the consensus score of fans and experts alike. As I have often said over the years it often all boils down to what a judge prefers in their own individual criteria of how they score a fight. Other factors such as where a judge is positioned at ringside and their ability to clearly see the action may also play a factor but overall it comes down to what a judge looks for when scoring a fight. Just as the consensus is that this fight was close so too is the opinion of many observers, this one included that Soliman’s victory was in many ways an upset that may have a long term impact on the Middleweight division. Never the less Soliman pulled out the victory and has earned another shot at the title. As for Felix Sturm? After suffering back to back losses one may argue that Sturm may be set back a bit in terms of his positioning as a top tier fighter in the Middleweight division. It would be foolish however in the eyes of this observer for one to think that Sturm may be through as a fighter. One thing that will work in Sturm’s favor is he was clearly was not disgraced nor dominated in his fights with Geale and Soliman and much like his fights with Murray, Macklin and, Oscar De La Hoya could have gone either way. It will be interesting to see what Sturm’s next move will be but with three world champions in the division and several prospects and contenders looking to position themselves for world title shots, I believe it is safe to assume that Felix Sturm remains very much in the mix. For Sam Soliman the victory over Felix Sturm is in many ways a career defining moment. It now sets up what may just be one of the most talked about and anticipated fights in Australian Boxing history. The obvious storyline going into that fight of can the grizzled veteran Soliman finally break through the glass ceiling by lifting a world title from a world champion whom one may argue is just entering his prime will surely have people talking. The two fights that have taken place over the last week to now set up what looks to be an intriguing battle to presumably take place in May of this year is yet another reminder that all of sport has turned international and that the sport of Boxing needs to be viewed on a global scale. I wait with great anticipation of what could be a great fight. Boxing’s Center stage will now shine on the Australian Boxing scene much as it has the UK and Germany in recent years and of course the focal points of Boxing here in America. I for one cannot wait to see the attention of the entire Boxing world focused on Australia. It’s long overdue.